I think I have a floral obsession. Look at my wardrobe! I love a nice print and the floral ones always seem to catch my eye. I have a mix of vintage, new and self made. One in particular used to be a Vintage apron that I fashioned into a skirt. It’s a good way of getting a one-of-a-kind fabric, especially if your area is a little short in the fabric shop department. So, (surprise surprise!) when I attended my friends wedding recently (who was a stunner on the day, by the way) i made a ditsy floral fifties dress for the big day . Initially, I was going to buy one but after a browse in town, I got tired of seeing the same thing plus there are the same go-to wedding guest outfit shops that a lot of the guests could turn up wearing. I think it’s one of the hardest things to shop for. You have to think of the weather, the style of the wedding, whether it’s day or night and the colour of the bridesmaids dresses (so you don’t turn up in the same colour!). Fortunately for me, I can sew, so I decided to make mine. I went through my fabric stash and unearthed enough floral printed silk for a dance friendly circle skirted style. 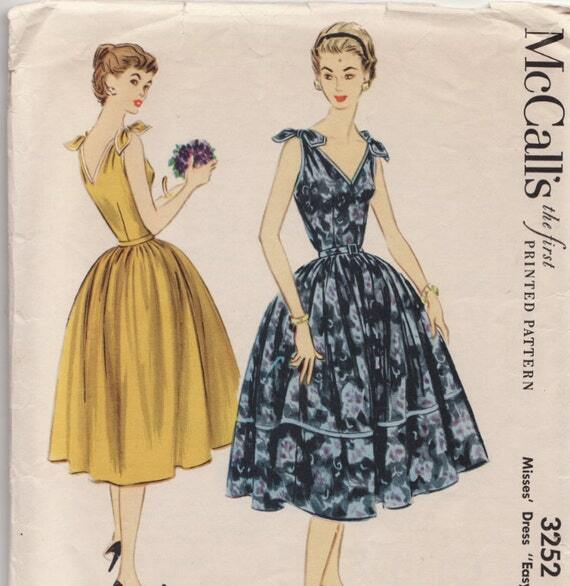 I do my patterns from scratch but if you’re not yet brave enough, you can buy a vintage pattern on Etsy. I found a pattern just like the dress I designed so it’s true, fashion does go in circles. The print is a feature in itself so a lot of detail would be lost among the pattern. I kept the shape simple with a fitted bodice and a full circle skirt. Now personally, I can’t just make a simple dress. I always have to add a little twist so I eliminated the bust darts and moved the excess fabric to the shoulder that was gathered to form a V neck and back. I edged the neckline, armholes and waistline with a cream piping. I think a garment looks a little more expensive when the seams and darts are hidden. And finally, for extra bounce in my dance step, a layer of springy organza between the lining and silk makes the skirt stick out a little more. It was the most comfortable wedding outfit I have ever worn so I think i’ll stay with the fifties shapes for the foreseeable future. “Vintage does take a little more effort than shopping on the high street, but the pay-off is worth it every time. Stick with me. I promise your wardrobe will be transformed and you will spend your money on things you really love. These clothes are timeless and unique; mix them in with your contemporary stuff and you will love standing out for all the right reasons. There are also some great video tutorials on there for all you sewing novices out there, so you can tailor make your vintage purchase. mairead <a> maireadlee.ie for more details.